"Art is my gratitude for the stars"
My wonderful husband, Master Painter & Author Richard Schmid. After graduating from the American Academy of Art in Chicago, Nancy continued her studies at the Palette & Chisel Academy and completed her schooling at the Lyme Academy of Fine Arts in Connecticut studying anatomy and sculpture with the late Dean Keller. Nancy met master artist and author Richard Schmid at the Palette and Chisel Academy, who became her mentor. Richard helped to develop her innate talents, which opened the doors to the Grand Manner style of painting. (Richard describes the Grand Manner as a certain mingling of virtuosity and unrestrained joy in Art.) "We would question everything" Nancy states, "ourselves, our paintings and this amazing miracle we are all a part of. He taught me to identify and understand what I am passionate about and then paint it." Currently Nancy is painting and completing her long anticipated and soon to be published book. She resides in the hills of New England and is living happily ever after with her husband Richard Schmid, their famous cat Zorro, and the new up-and-coming star, Max the cat. *First Prize. Art Renewal Center International Salon. 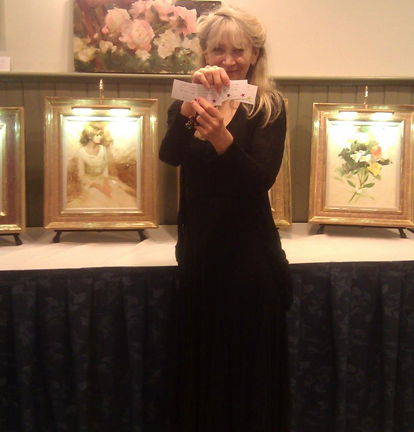 *ARTrageous Art Auction, New York NY. Nancy raised over $10,000.00 which benefits foster children of NY. *First Prize. Midwest Pastel Society, Chicago, IL. *Best of Show. Fine Art Views. *Award of Honor. Cecilia Beau Forum, Butler Institute of American Art Museum, Youngstown, OH. *Honor Award. Portrait Society of America. *Purchase Award. Wichita Art Museum, KS. *Master Artist Instructor. American Artist's "Weekend with the Masters". *Teacher, Faculty, Alumni and Face-Off Demonstration. Portrait Society of America. *Instructor and Keynote Speaker. Scottsdale Artist School. *Co-Creator, director and teacher. Putney Painters, Putney VT.
*Quiet Expressions of Joy"--Paintings & Drawings. Tucson, AR Curated by Kristen Thies. *"A Return to Understated Elegance". Cape Cod, MA Curated by Kristen Thies. *Richard Schmid & His Influence, Exhibition theme: Childhood Innocence. New York, NY Curated by Kristen Thies. Nancy, at her sell out show, with Kristen Thies curator and owner of West Wind Fine Art Gallery.